Early Sunday morning, fire destroyed the American Shakespeare Festival Theater in Stratford. News reports noted that the 1,500-seat venue — modeled after London’s Globe Theater — hosted performances by Katharine Hepburn, Helen Hayes and Christopher Walken. When the theater thrived, its garden on the banks of the Housatonic River featured a garden with 81 species of plants mentioned in the Bard’s plays. 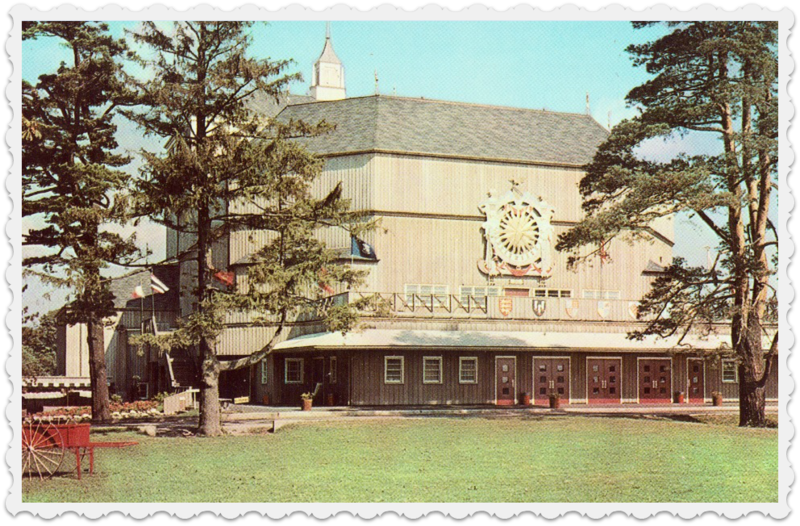 The American Shakespeare Festival Theater in Stratford, in its heyday. Papers reported too that the idea for the theater came from Lawrence Langner. It was not his first rodeo. In 1930 — 25 years before developing the Stratford venue — the Weston resident turned an apple orchard and old tannery into the Westport Country Playhouse. But Westport’s connection to the American Shakespeare Festival Theater runs far deeper than that. In fact, our town was almost its home. In 2014 I posted a story that began with a note from Ann Sheffer. The Westport civic volunteer and philanthropist — who had a particular fondness for the Playhouse, where she interned as a Staples High School student — had sent me an old clipping that told the fascinating back story of Stony Point. 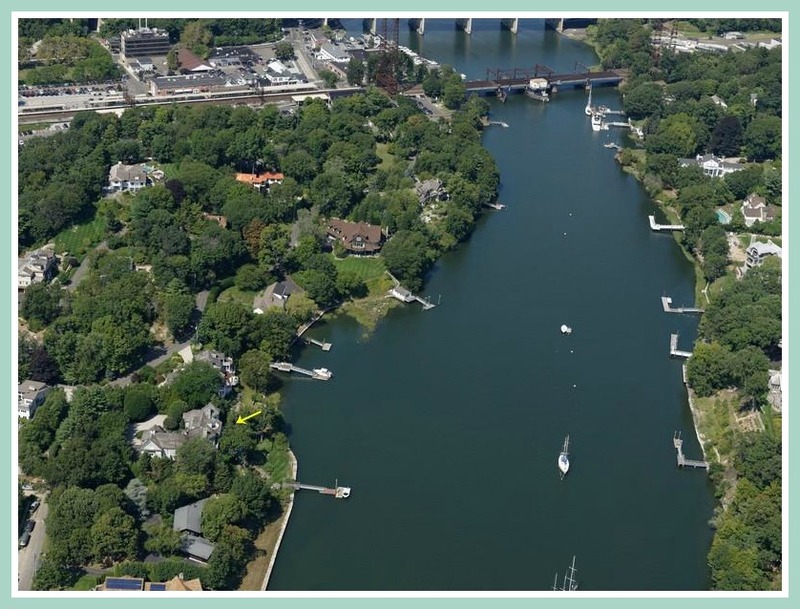 That’s the winding riverfront peninsula with an entrance directly off the train station parking lot, where Ann and her husband Bill Scheffler then lived. Stony Point today (left of the river). The train station and tracks are at top. Written in 1977, the Westport News piece by longtime resident Shirley Land described a New York banker, his wife and 2 daughters. They lived in a handsome Victorian mansion with “turrets and filigree curlicues.” The grounds included an enormous carriage house, gardener’s cottage, barn and hothouse. It was the Cockeroft family’s country home, built around 1890. They traveled there by steam launch from New York City, tying up at a Stony Point boathouse. The 2nd daughter bequeathed the estate to the Hospital for the Crippled and Ruptured (whose name was later changed, mercifully, to the New York Hospital for Special Surgery). But the property fell into disuse. Eventually the hospital sold Stony Point to real estate developers. 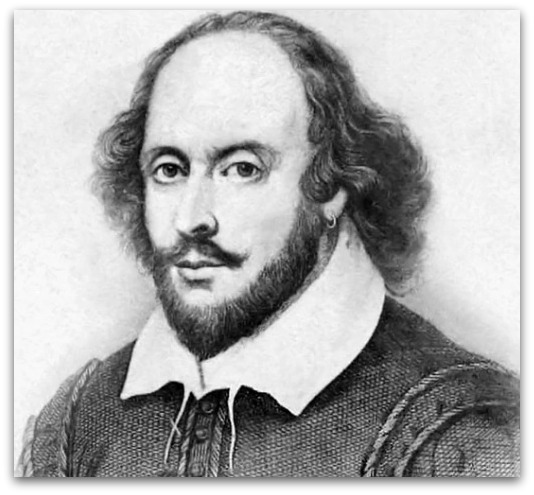 Which brings us to Shakespeare. Around 1950 Langner, Lincoln Kirstein of Lincoln Center and arts patron Joseph Verner Reed had audacious plans. They wanted to build an American Shakespeare Theatre and Academy. And they wanted it on Stony Point. Proximity to the train station was a major piece of the plan. The price for all 21 acres: $200,000. The theater was never built in Westport. It opened a few miles away –in the aptly named town of Stratford — in 1955. It achieved moderate success there. But in 1982 the theater ran out of money (and backers). The state of Connecticut took ownership. It closed in 1985. The garden turned into weeds. The theater grew moldy. The stage where renowned actors once performed the world’s greatest plays was taken over by raccoons. The entrance to Stony Point. Meanwhile, in 1956 Westporters Leo Nevas and Nat Greenberg, along with Hartford’s Louis Fox, bought the Stony Point property for residential development. It’s now considered one of the town’s choicest addresses. A recent listing for one home there was $14 million. That’s quite a story. We can only imagine what might have happened had Westporters decided to support — rather than oppose — the American Shakespeare Festival Theater in Westport. This entry was posted in Arts, Looking back, Organizations, People, Real estate, Westport Country Playhouse and tagged Ann Sheffer, Lawrence Langner, Shakespeare American Festival Theater, Stony Point, Stratford Connecticut. Bookmark the permalink. Ann Sheffer and Bill Scheffler are married — and yes, those are their correct names! Today I learned…The train station was originally on the other side of the river…..
On the western side of the river there are RR buildings shown on the northern and southern sides of the track in the same general locations as the present day stations are located, in fact that portion of the street now known as Railroad Place running in front of the present-day station is called “Depot St.” on this map. On the eastern side of the river there are two “R.R. Co.” buildings shown on the southern side of the tracks. Perhaps that was a passenger loading point, note that this was a single track affair back then so passengers could get on or of trains on the same side of the tracks regardless of the direction. Oddly enough, this map notes that there is a footbridge on the train bridge, but on the upriver side. Interesting and once again I am reminded how well you tell a story Dan. I so enjoy reading 06880. Just imagine the horrid traffic that would have created. Not to mention diminished properly tax revenues if a non-profit theater had been built there instead of housing. And, the stink of failure that would permeated the area and all of Westport when it failed. Or the money sink it would have become had the town been forced to step in. So what if it was for the Arts. Chalk up another win for NIMBYism. What a loss for the arts in our state that the Shakespeare Theatre is no more. The Stratford location, however, is sufficiently remote that it would have been hard for a theater to thrive there. It should have been located in lower Fairfield Cty. When I lived in DC, we were season ticket holders to the Folger Theater where they perform 3 Shakespeare plays and one classical play (like Shaw, Garcia de Lorca, Tennessee Williams, etc) each year, and the Folger was always chock full of Shakespeare appreciators and attendees, where one could always mix with other regular season ticket holders, such as senators like Sen. Daniel P. Moynihan, federal judges, Attorney Generals, and various Cabinet members. Every seat was always full! The Folger had and has the highest quality Shakespeare theater in the country. In the spirit of Westport Playhouse’s past history of hosting summer traveling plays, I wish our playhouse could invite a Folger Theatre play troupe up here during the summer after they finish a performance in DC, to keep quality Shakespeare theater alive in CT. I betcha we could even find state money to help in that effort! MOST interesting, and sad that it did not happen…. Thanks!!! I live out of state, northern Illinois actually, and do not see all area news. Has it been determined what caused the fire at the theater? Is that known? Appreciate the response. Thank you. Not yet. In fact, officials say it could be months to determine the cause.